Magic Hatter [D5392] - $16.50 : Yarn Tree, Your wholesale source for cross stitch supplies. Cross stitch pattern by Alessandra Adelaide Needleworks. Pick your magic hat! 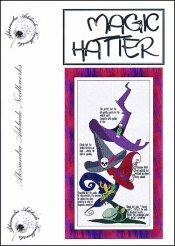 Complete with a potion of love, the purple hat is perfect for all of the worldly events. Needing something a little more serious? Try on the skull hat! Feeling a little more adventurous? Perhaps the dusty cobweb on the blood red cocktail hat will do?!? Still not feeling it? For a little security during dangerous encounters, the frog hat will protect you! Walking through an abandoned forest, you will definitely need "forest gear" to help camoflauge you in. Stitch count is 193w x 386h.